Manufactured in England, the Black Rhodium Titan cable removes distortion from your music for clear and authentic audio performances. 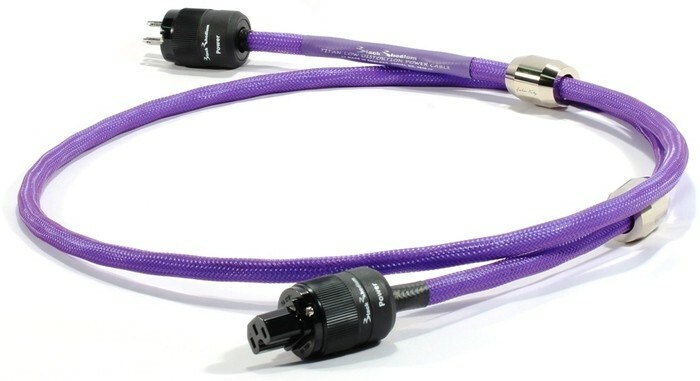 The Black Rhodium Titan mains cable has three individual screening layers to prevent any high transients in the cable from interfering with other cables nearby, but also to protect the mains voltages it carries from all external noise. It employs additional noise cancelling technology that enhances the sound quality and increases the pleasures of listening to music. Maintaining the clarity and eloquence in vocals, the cable separates musical instruments remarkably through a dramatic reduction of ‘Transient Phase Distortion’ acheived by using thicker insulation to increase the distance between conductors. This reduces the magnetic field seen in each conductor wire as a result of the magnetic field created by the current in the other conductor wire. The benefit in listening is a clearer and more open sound quality. Titan is covered in a tightly braided screen to prevent inner cores from picking up radio frequency interference. Further screening is provided by the conductive ‘low microphony’ layers and by twisting the cores. The screen is connected at only end only to prevent ‘loop aerials’ between equipment picking up noise. An untwisted cable has a large surface area that can more easily pick up RFI/EMI signals generated from Radio, Wifi, Mobile Phones and even central heating systems. Complementary filtering techniques are additionally applied to ensure that any interference that does penetrate the cable’s very effective defences is effectively neutralised preventing audible distortion interfering with the music. All these treatments are designed to reduce the amount of audible distortion in the cable, allowing cleaner, clearer sounds to be enjoyed from your equipment. Fitted with two Graham Nalty legacy Range VS-1 Vibration Stabilisers on each cable, yhe vibration stabiliser has been specially designed to reduce audible cable distortion by limiting the effects of vibrations travelling through the conductor wires. The benefits of a tighter sound of the VS-1 are enjoyed in all types of music, but in particular plucked strings such as double basses and harps are reproduced much sharper. Titan power cables use high quality PTFE insulation for both internal wiring and the outer jacket for low dielectric absorption loss. PTFE is very effective as when a voltage is applied to a cable the insulation receives a small electrical charge. As the voltage reduces, the charge is released back into the conductor and in musical terms this can cause time smearing of the sound which partially distorts leading edges and decays in music. The low dielectric absorption in PTFE reduces this effect for the benefit of better sound quality. Titan mains power cables use three silver plated copper cores for positive and negative signal flows. These are connected in opposite directions to lower the noise floor between musical notes for ‘blacker’ silences in the interval between musical notes and enhanced reproduction of the musical edges and natural decays in music.